Central on the original concept of Hadoop is the map-reduce paradigm/architecture. Mapreduce is based on two entities: one Job Tracker and a series of Task tracker (mostly one per data worker). This paradigm is powerful but this is only one way to accomplish distributed computing. This approach is batch oriented and is targeting crunching large files making the most use of data locality. However good mapreduce is for a specific class of distributed computing tasks, it is not a general pattern that applies well for all applications. Rather than forcing the mapreduce paradigm on each application running on the cluster hadoop 2.0 and yarn focus on the idea how to separate the hadoop application (mapreduce) from a more general problem of resource monitoring and management (yarn). Central to hadoop map-reduce v1 is the job tracker. This is a single cluster agent which has to take care of several functions. It monitors tasks, it schedules tasks to task trackers, re-schedule them if the task tracker fails to execute the task. Hadoop 2.0 re-invents the concept of distributed computing on hadoop. Hadoop is more than mapreduce, in encompasses real time distributed computing (Tez, Storm), in-memory computing (e.g. Spark), graph database (Giraph), bigtable (Hbase), and more. In a way, moving forward from the traditional job-task tracker and map-reduce paradigm has been achieved by splitting the higher level function (map-reduce) from the resource manager/negotiator. In a nutshell, the idea of hadoop 2.0 is that the resource manager is redesign to work with any arbitrary higher level app. The new resource negotiator is introduced in the architecture as YARN (yet another resource negotiator). In a way YARN provides a data functional lake. A lake of distributed processes and functions. A data distributed scheduler which in facts transform the data lake in a process lake. A data distributed process OS. In YARN, when you submit a job you push the job to a scheduler which allocates resources according to a resource constraints scheduling algorithm of choice. The Resource Manager manages the Application Managers, which conversely have full control on the distributed task management: start, stop, and monitoring your function. As you can see, map reduce can be described as a specific application manager on hadoop 2.0. When the client wants to execute a new job. It will start by negotiating resources with the global resource manager. 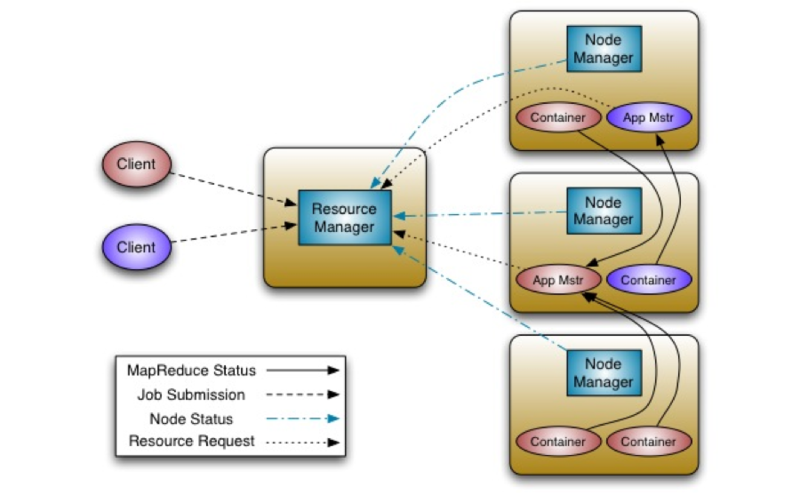 The resource manager collects the information about available resources (containers) from the node managers. After the resources are negotiated, the job is delegated to an instance of the application manager which "understand" the client job type. The Application manager spawns and monitors a number of containers, on a number of nodes. The monitoring of container is globally coordinated by the application manager instance. However to node managers can locally tune and control the node resources, and the local containers. Hadoop 2.0 and YARN will unleash a much wider range of distributed applications, compared to what has been available so far under the map-reduce file-based batch-base paradigm. While everybody is free to package a new hadoop application, by writing a new application manager for that, the road map looks promising and many of the current application (storm, giraph, spark, Tez) might be soon available as standard yarn 2.0 applications. As of today only the map reduce application is available as a yarn application. When other components will migrate to yarn / hadoop v2 is still unclear. Thanks to Rich Raposa from hortonworks for kindly answering so many question about YARN, HA, and the hadoop 2.0 architecture during strata 2014.